A classic delicacy, one full pound of tender mussels sautéed with scampi butter and served with garlic toast. Seasoned, lightly battered strips of calamari fried and served with our sweet and spicy chili sauce. Mushrooms stuffed with crabmeat stuffing, topped with cheese, and broiled to perfection. A true southern favorite! Double hand-breaded to achieve the perfect coating. Our special breader and our homemade sauce sets our onion petals ahead of the competition. Sweet and mild mix of conch mixed in a savory batter then fried to perfection. A delicacy to many cuisines, it has a taste similar to chicken but more tender. Piping hot Mozzarella cheese, deep fried, encased in a crunchy breading. Shrimp rolled in a light coconut breading and then fried. Served with a sweet and spicy sauce. This dill pickle recipe will have you puckering your lips in no time! Sweet corn battered into bite size pieces. Fresh yellow squash thinly sliced, breaded, and fried to a crispy golden brown. Our homemade spread is like no other! Three crab cakes loaded with crab meat. Served with Remoulade sauce. A true seafood delight, thought of by many as the best tasting crab available. You will not find a gator more tender! Fried shrimp tossed in a spicy buffalo sauce. * Item may be cooked to desired temperature. Consuming raw or undercooked meats, seafood, shellfish, or eggs may increase your risk of foodborne illness. All entrees are served with hushpuppies and two sides. 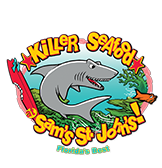 Choose From: Pollock, Shrimp, Clam Strips, Crab Cakes, Chicken Strips, or Scallops (Substitutions available for an additional charge). 10 and under. Served with hushpuppies, two sides, and a drink. All entrees include 2 sides. Choose two: Pollock, shrimp, clam strips, crab cakes, chicken strips, or scallops. Choose three: Pollock, shrimp, clam strips, crab cakes, chicken strips, or scallops. 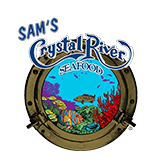 Shrimp, Pollock, Crab Cakes, Clam Strips, Scallops, or Chicken Strips (Substitutions available for an additional charge). Includes Pollock, Shrimp, Clam Strips, Scallops, Oysters*, Crab Cakes, and choice of 2 sides. Includes Pollock, Shrimp, Clam Strips, Scallops, Oysters*, Crab Cakes, and choice of 4 sides. Served with a tossed salad, one side and garlic bread. Shrimp and Scallops sauteed in garlic butter with mushrooms and onions. Served on a bed of rice. Broiled to perfection in garlic butter and then topped with Parmesan cheese. Filled with crabmeat stuffing, broiled and topped with Monterey Jack cheese. Certified Angus Beef is hand selected from the top 8% of all beef. We hand-cut our steaks after allowing them to age for a minimum of 21 days. Coke, Diet Coke and Sprite. "Consuming raw or undercooked meats, poultry, seafood, shellfish or eggs may increase your risk of foodborne illness"
We fry the "No Cholesterol Way" Zero grams of trans fat per serving. Our food is prepared only when ordered, so please be patient as your selection is being prepared especially for you.